This is the third book in the YA series, read first two over a year ago, and continues the tale of am 11 year old boy, Gregor, who falls down under New York City and discovers a world full of conflict. He and young sister, Boots, come across a race of pale humans and large talking creatures (bats, cockroaches, rats, among others). Gregor learns he is part of a prophecy and heads out on a quest, that leads to him finding his lost father. The first two books kept me wanting more until it was done – four hours for each, which is fast for me since I have ADHD! The pace was quick, the character development was rich and the climax was built to a perfect crescendo. 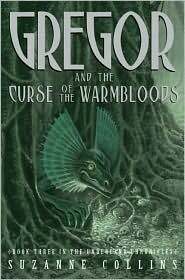 With that being said, the third installment in Suzanne Collins Gregor the Overlander series, The Curse of the Warmbloods, does an adequate job carrying on the story of this unlikely hero. The basis of the plot is that there is a plague in the Underland and Gregor is once again brought in as part of a prophecy, this time with his mother (who doesn’t like Gregor going to this world). The mother becomes ill and the race to find the cure is on. Gregor and the gang have a goal to find the cure and cool a rising conflict between the Rats and Humans. The characters are mostly part of the same group, but there a few additions to the cast. The pace is good, but not up to the first two. There is a good amount of peril and a couple characters are developed in more detail, giving the reader new insight into this world. I found myself not caring as much about the group of characters and was a little underwhelmed at the end battle. The answers to the cure and the genesis of the disease was a nice touch, but a bit predictable for me as an adult reader. While I have pointed out a few weaknesses in the story compared to the first two, Ms. Collins does a great job creating a fantasy world that becomes more real as the reader progresses through the books. It is a strong story as a whole and deserves to be read. It has an 11 year old character, but this story is classified as YA. I found it in the MG section of my local library. So, parents should be aware that the level of action, violence and death is more than other books with similarly aged characters.